Update 3/25/16: Another excellent resource for California residents is California Quality Care. Update 4/11/12: Since I wrote this article, the brilliant Jill Arnold from the Unnecesarean started a new website where she shares cesarean rates by hospital: CesareanRates.com. I would recommend checking this resource first before trying out the strategies I describe below. I want to plan for a VBAC I am not pregnant as of yet but will be ttc in 2 months. I am from La Crosse WI area and they have two hospitals Gunderson Lutheran and Franciscan Skemp..when I called them to get there statistics about VBACs they told me they didn’t have any. So how should I choose which hospital to go to for the better chance of succeeding with my VBAC. I also do not have any doulas in the area is it necessary to have a doula for a successful VBAC? Any thoughts or suggestions would be great. Thank you. A vaginal delivery is the preferred, naturally-designed way to have a baby but when needed, delivery by Cesarean section is a second option. At Gundersen Lutheran, efforts are made to choose a vaginal birth, even after a previous C-section unless there are reasons that would put mother or baby at risk. They have succeeded in their goals as Gundersen Lutheran boasted a 27.3% VBAC rate in 2006. That is exceptional considering that the national average is 9.2% (CDC 2006) and the Wisconsin state average is 12% (Wisconsin: Infant Births and Deaths 2006). Ted Peck, M.D. is named “activity leader” on that page so I would contact him and ask for the top three VBAC doctors at Gunderson Lutheran. I would also check out the resources here for additional referrals and to see if any of the names overlap. Keep in mind that just because the hospital has a great VBAC rate doesn’t mean that all the OBs are supportive of VBAC. You will still want to ask the same questions and interview a couple different doctors, just like you would get more than one quote if you wanted work done on your house. You are the consumer, you have the power to choose who you will hire! 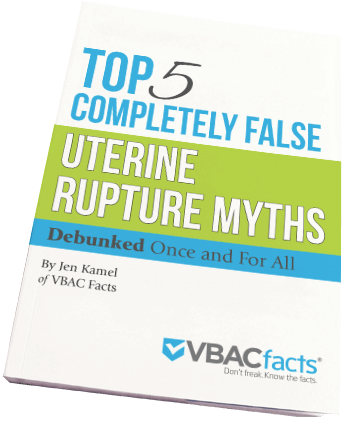 It’s important for you to understand the risks and benefits of VBAC vs. repeat cesarean to you, your baby, as well as your future children and health, but be on the look out for scare tactics masquerading as informed consent. [Hospitals] ban VBACs under the guise of patient safety. But patient safety is a euphemism for “we don’t have a good evidence-based reason to do it, other than we don’t want to get sued, it’s more expedient, and we make more money from c-sections—the hospital does, not necessarily the physician, but the hospital does—so we’re going to ban it because it’s easier for us, and we’re going to say it’s for patient safety because of the risk of rupturing the uterus.” But you know what? That risk should be something that the patient decides. Patients have a right to be given informed consent, free from misinformation or coercion, free from skewing information that benefits the practitioner or the hospital. And they have the right to consent or refuse to accept the treatment that’s offered. That right is frequently being denied. If I was unable to easily find this information by googling, I would have gone to Wisconsin’s Department of Health Services and just start searching for VBAC, birth, cesarean, and hospital statistics to see what I could find. Sometimes this data is so deep within a website, it can be tricky to locate. You could also call the Department of Health Services and ask them if they maintain hospital birth statistics. The state of California maintains this data, but I don’t know if all states do and if they make that information available to the public. In terms of a doula, yes, I think it’s very important for any woman laboring in a hospital, especially women seeking a VBAC, to have a doula. (Here is more information on what a doula is and the many benefits of having one: DONA’s Birth Doula FAQs.) Some practices are not supportive of doulas, even going so far as to post a sign in the waiting room detailing their anti-doula policy. Switch providers immediately if you read a similar sign or if you discover that your provider is not doula friendly. A great way to find out is to ask your OB or midwife if they have any doulas they can recommend. Their response will quickly tell you if this care provider and you have the same vision for your birth. Hopefully you two will be a good fit and if not, the list of resources I provide for finding a supportive OB or midwife can also be used for finding a doula. I would add DONA and toLabor (formally ALACE) which are Doula credentialing organizations as additional resources. DONA lists 64 birth doulas and toLabor lists 10 birth doulas in Wisconsin. You can find more VBAC statistics by going to the The Birth Survey’s State Resources page which provides links to each state’s birth statistics. We can determine the VBAC rate by adding the number of Repeat C-Sections (7,418) and VBACs (1,017) together to get a total number of births after cesarean in 2006 (8,435). By dividing the total number of VBACs (1,017) by the number of births after cesarean (8,435), and multiplying that number by 100, we get the VBAC rate of 12.06%. This means that 87.9% of women in Wisconsin have repeat cesareans. Here’s hoping you are in that 12%! I am in Salem Oregon and trying to find VBAC vs repeat cesarean rates for legacy Silverton medical center vs. Salem hospital…..I have found total related njumbers but not repeat cesarean stats…help? Hi Erika! If the stats you are looking for aren’t available via the steps above, next option would be to contact the hospital directly. Check out the hospital’s website. They might have it there. Your province might also have a health department that maintains such data. Some people have had success calling the hospital directly. I wrote to you a while back. Probably in January. I did deliver at Balboa and I was given the chance for a VBA2C. My body did not do so well and I ended up with another csection. While I am sad that I had that csection I am very glad I WAS given the choice. I did not have to fight for it. I was VERY lucky to have a MW team that believed in ME and a womans body…. Please advise anyone that goes to Balboa to see Christina Booth (she should be back now) and doctor O’Neil.